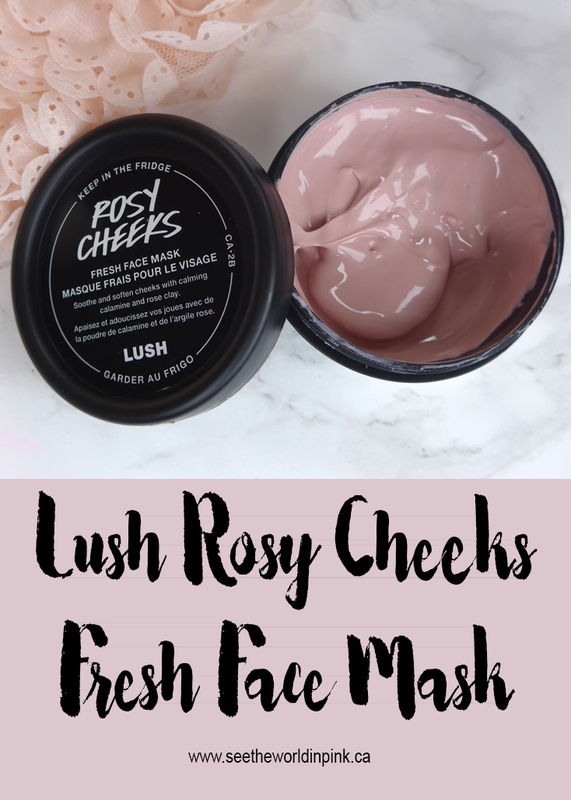 Lush Rosy Cheeks Fresh Face Mask - Try-on and Review! Have I established on here that I'm a Lushie?! I feel like I've been pretty open about my love of Lush products! It's actually rare for me to find a Lush mask that I haven't tried - I love to try them all! But, I haven't tried Rosy Cheeks yet, which is surprising because I love rose products on my skin! Lush Rosy Cheeks Fresh Face Mask ~ $12.95 CAN. Find the happiness you seek by cleansing cheek to cheek with this gorgeously soothing fresh mask. A simple blend of kaolin, calamine and Turkish rose oil delicately calms the skin and restores balance. Whether you're feeling hot and bothered or just love showering your complexion with roses, cleansing calamine and kaolin will gently remove dirt while exquisite rose oil nourishes and tones your face. Calm, matte skin, here you come! So this mask is all about soothing, softening, and calming the skin! This sounds like it will be nice and gentle on the skin, which sounds good to me! Just a note, if you are interested in the Fresh Face masks, they are only available in stores as they need to be refrigerated! But, I love picking these up with Lush's black pot recycling program - bring 5 black pots back to the store and pick up a free face mask in exchange! I love that, so while I usually pick my favorite Lush mask, once in a while I will try something new! This is a nice smooth mask - it is nice and thick, but still applies really easily on the face! Also, if you like the smell of roses, you will enjoy this mask! This mask is easy to apply - it goes on smoothly (wash skin first), wear for 15 minutes, massage off with warm water. I do find the Lush Fresh Masks are all a little difficult to rinse off - they are a thick formula that dries down so it can take a few rinses to remove. Overall, this certainly delivered on smoothing and calming the skin. I did use this when my skin was feeling a little rough and textured, so I noticed the soft and smooth results instantly and the next morning as well! It was also very gentle on the skin! The fresh masks are also great because the come out of the fridge so they are cooling on the skin as well! Have you tried the Lush Fresh Face masks? Which one is your favorite?